You are racing on a 2D lattice grid starting from the origin (0,0) towards a goal (M,N) where M and N are positive integers such that 0 < M <= N. There is a checkpoint that’s neither on the origin nor on the goal with coordinates (m,n) such that 0 <= m <= M and 0 <= n <= N. You must clear the checkpoint before you reach the goal. The shortest path takes T = M + N steps. At each point, you can move to the four immediate neighbors at a fixed speed, but since you don’t want to lose the race, you are only going to take either a step to the right or to the top. Even though there are many ways to reach the goal while clearing the checkpoint, the race is completely pointless since it is relatively easy to figure out the shortest route. To make the race more interesting, we change the rules. 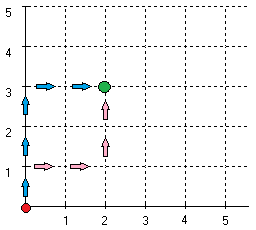 Instead of racing to the same goal (M,N), the racers get to pick a goal (x,y) and place the checkpoint to their liking so that there are exactly S distinct shortest paths. Placing the checkpoint at (1, 3) and the goal at (2,3). There are 4 ways to get from the origin to the checkpoint depending on when you move to the right. Once you are at the checkpoint, there is only one way to reach the goal with minimal number of steps. This gives a total of 4 distinct shortest paths, and takes T = 2 + 3 = 5 steps. However, you can do better. Placing the checkpoint at (1, 1) and the goal at (2,2). There are two ways to get from the origin to the checkpoint depending on whether you move to the right first or later. Similarly, there are two ways to get to the goal, which gives a total of 4 distinct shortest paths. This time, you only need T = 2 + 2 = 4 steps. As a Hacker Cup racer, you want to figure out how to place the checkpoint and the goal so that you cannot possibly lose. Given S, find the smallest possible T, over all possible checkpoint and goal configurations, such that there are exactly S distinct shortest paths clearing the checkpoint. As input for the race you will receive a text file containing an integer R, the number of races you will participate in. This will be followed by R lines, each describing a race by a single number S. Lines are separated using Unix-style (“\n”) line endings. Your submission should contain the smallest possible length of the shortest path, T for each corresponding race, one per line and in order. Let’s start from the following problem. 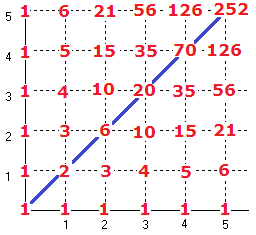 Given a lattice grid and a starting point (0,0), find how many there are ways to reach point (x,y) using no more than x steps to the left and y steps to the top. The problem is known as “Block walking”. One important property of this equation is that G(x,y) = G(y,x). The values in the grid are symmetrical G(x,y) = G(y,x). The program doesn’t even have to store the complete grid, only the previously calculated row or column. There is no need to perform calculations when any of coordinates is equal to 0 or 1. This will be implemented in the final solution. 1)If S = 1 output 2.
i. Find all points (m1,n1) and (m2,n2) such that G(m1,n1)=S1, G(m2,n2)=S2. To calculate point (m1, n1). Build rows of triangular matrix G until numbers in the row are less than S1. If number G(x,y) = S1, then use m1=x, n1 = y. There are might be several such (m1,n1) in the matrix. 1. For each found (m1,n1),(m2,n2) find minimum T0 of m1+n1+m2+n2. 3)The smallest found T0 is a solution. Example: consider S = 9. 1) Factorization gives us two pairs (1,9) and (3,3). 2) The smallest found T0 is 6. There is no need to recalculate matrix G for each number S. Instead in the solution the rows of the matrix G will be built until numbers in the row are less than 10000000 (task constraint). Based on the matrix, a mapping from integer to a list of points < (x1,y1), (x2,y2), … > will be created, such that for each point (x,y) in the list of number N: N = G(x,y). Which means that step 2.a.i is no more than two lookups in such a mapping. The program can build a mapping once and reuse it while processing all test cases. The longest list of points in the mapping. Surprisingly enough, the longest list appears for the number 3003 and the length is 4. So, in the worst case it will lead to a loop of 4*4=16 iterations at the step 2.a.i.1. That should not be of any performance problem. The number in the range of [0.. 10000000] that factorized into maximum number of two different multipliers. I have performed factorization of all numbers, it took about ~3 minutes. This magic number is 8648640 giving 224 pairs of numbers. So the worst possible input is 20 numbers equal to 8648640. Running the program on this input proves that on my machine it will take less than 15 seconds for any possible input. Most of that time spent on building the mapping.